Our everyday interactions with the world around us are determined entirely by classical physics. Objects have well defined positions, they respond to the application of forces according to Newton’s Laws, and nothing appears probabilistic. However, at the subatomic scale, where one considers the behavior of, say, individual electrons, the universe behaves in a very different manner. The physics at this scale is instead described by a theory known as quantum mechanics, in which subatomic particles are viewed as waves instead of point particles. Nature does everything in its power to hide its quantum reality from us, which is why our world appears so classical in the first place. Although solids are comprised of millions and millions of “wave-like” electrons which all behave in an indisputably quantum fashion, at the end of the day almost all materials are well described by classical physics. Despite the complexity of quantum mechanics at the microscopic scale, measurements on the macroscopic scale nearly always give classical results. Quantum matter is simply the opposite. These materials often possess electrons which strongly interact with one another, so that the “quantum-ness” cannot be ignored. In a sense, classical physics breaks down and one is forced to use quantum mechanics to describe their properties, even macroscopically. There are many forms of quantum matter and scientists all over the world are uncovering more every day. Each type constitutes an entirely new phase of matter with remarkable properties which may one day lead to technological revolutions. Already, the theoretical and experimental ground work for a new class of computers based on quantum matter – “quantum computers” – is being laid. The technology of past generations has been entirely classical but the technology of future generations is indisputably quantum. How do we know if a material is “quantum matter” or not? Shine some light on it! I’ve dedicated my career to using light from the microwave to the visible spectral range to uncover the properties of these exotic materials. 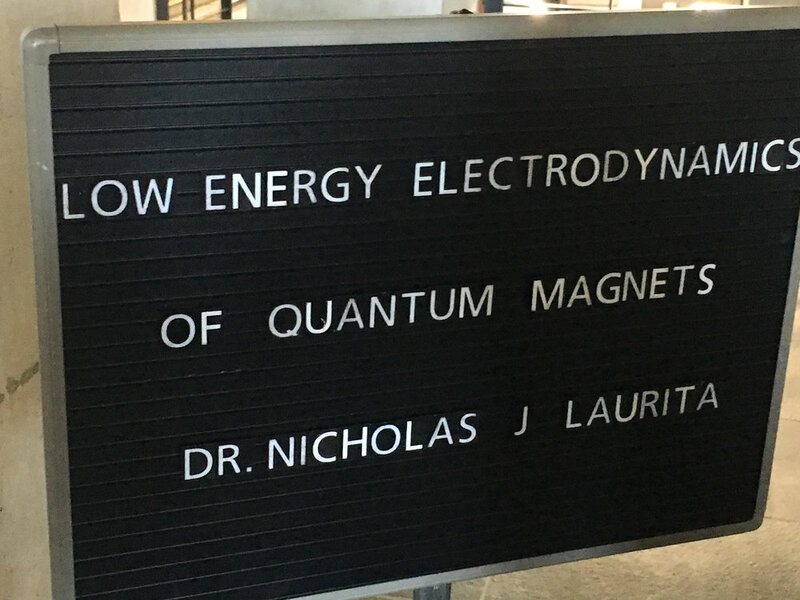 In my graduate research, I studied the electrodynamics of quantum matter by creating excitations with low-energy light. The properties of the ground state of these materials is naturally encoded in their low-energy excitation spectrum. As a post-doctoral scholar, I use visible light generated by intense ultra-fast pulsed lasers to study the symmetries of quantum matter through their non-linear optical interactions. The symmetries, or lack thereof, of these materials often provide insight on the ground state properties.